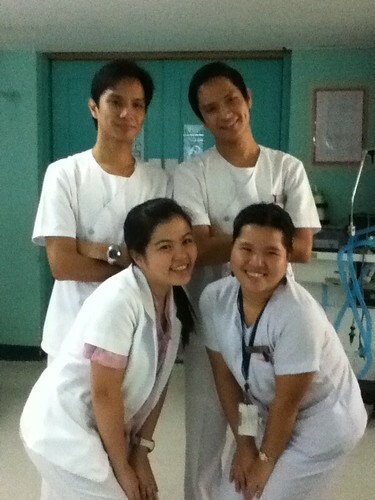 IN THE MIDDLE of our first week at the Medical Intensive Care Unit, some of us were fielded to the newly-opened LICU. The L stands for Leptopsirosis, a disease caused by microorganisms transmitted through the urine of rats. Weeks after the massive flooding in Metro Manila, a deluge of severe lepto patients was imminent. Fortunately the unit wasn't officially opened yet; there needed to be about 25 consults a day for the LICU to be activated. Since there was hardly any patients, Lennie, Ching, Marv, and I went to the pantry to finish our breakfast, and we found this note—a perfect blend of good handwriting and sarcasm. Below was an empty box of BonChon takeout meal. Here's Dr. Gian Carlo Carpio, IM first year resident, who offered free pieces of advice, both professional and romantic, to my lovelorn friends. 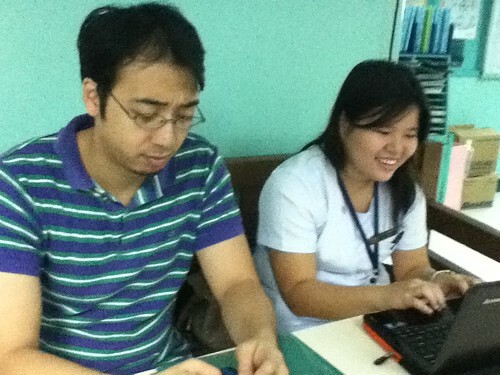 Dr. Kenneth Samala was also fun to work with. During idle moments, he'd confess his fascination for local show business, a preoccupation that resonated with Stephanie Ang, one of our interns. Leeca Caro told me that MICU was her best rotation to date, and so far I'm seeing why that's so. The residents are willing to teach during the rounds, prying our clinical histories for loopholes, asking us for the salient points, expecting us to remember the important labs and management goals. 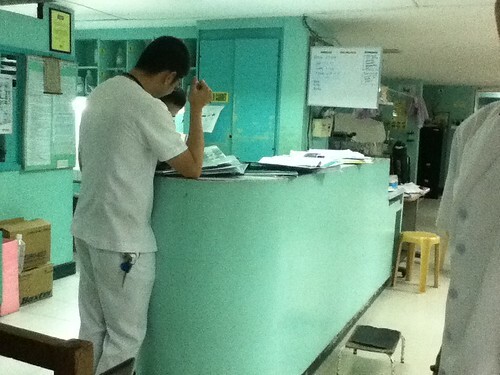 If all rotations in PGH were like this, we'd all end up smarter doctors. We had our dose of fun, too. Consider, for instance, the recent discovery that we have two pairs of Jaboom twins! Franco and Miguel Catangui and ... Lennie Chua and Kirth Asis! Not to be forgotten was the group photo session, just before we "escaped," albeit temporarily, for lunch. Although we only got to know them for a week, we will surely miss the company of our interns, all of them easygoing, smart, efficient, and responsible. They were a joy to work with. We'll see you around, Jasson Arcinue, Kirth Asis, Inec Barbosa, and Stephanie Ang! 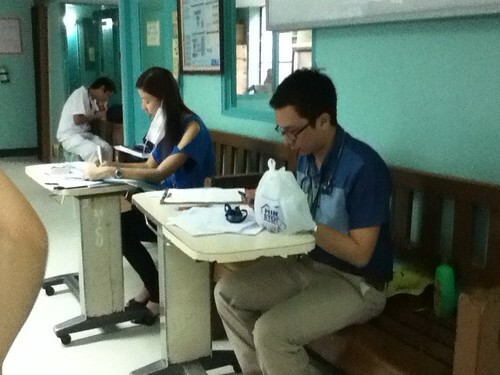 Sa Nurses' Station ito, Ate, so parang nurse 'yung nagsulat niyan. Speaking of doctors' handwriting: may mga okay talaga magsulat; meron din namang mukhang ECG tracing ang orders sa chart. 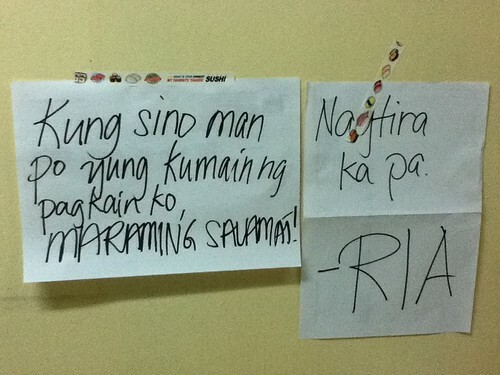 Hahaha, from all of us, thank you, Anonymous!